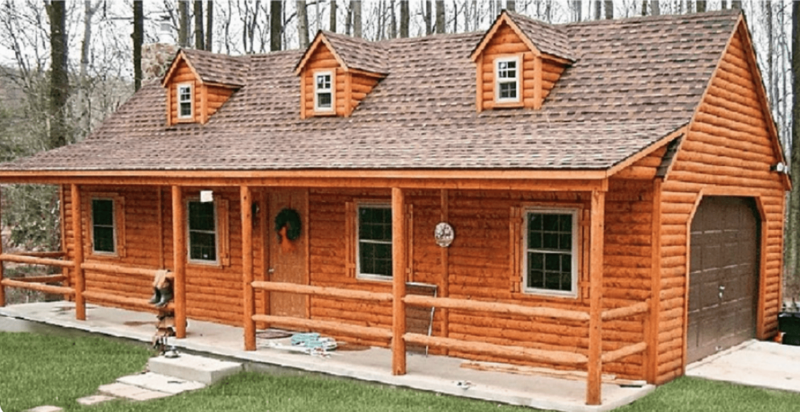 The Cape Cod Modular Log Cabin is a log sided home from Hill View Mini Barns. It’s a well made and designed log home that uses log siding instead of full round logs to achieve that real log home look without the high price point of a real log home. The log cabin has a great open main floor with bedrooms efficiently located upstairs, and the garage is very tidily tucked away on one side of the structure. That means you can jump out of the car or into it without going outside. That is a great feature when the weather is not cooperating, and you are dealing with rain, snow, wind or the other elements as you try to get from place to place. So the garage is a great feature in this structure. As well, the front porch is inviting and friendly, and your guests, kids, family and friends, will spend many hours just hanging out side. This space is large, friendly and open, and really gives you a lot more space to enjoy. Even on rainy days, with the over hanging porch roof, you and your family can hang out here. That is real function for a space in any part of your home. The entry way is quiet, centrally located at the front of the house, as a solid construction door. All of the rooms are all functionally located for both enjoyment and privacy. Front windows allow plenty of light and fresh air to circulate throughout the space, but with the front porch acting as both an invitation and a buffer, the windows are also very private. The upper story has dormer windows that form small peaks on the front of the house making it even more appealing and open to the street. Yet, the windows are still very high and so they are also very secure, safe, as well as remaining quite private. This truly, compact and lovely log home has a peaked roof so the snow, rain and other elements will always run right off the roof and away from the house. This is a great design strategy. That method means that this roof will last a long time. Even the slight roof over the exterior porch has a good pitch to it, ensuring that water and snow fall off and out away from the home. The logs used to build the exterior structure are made to code, and so will last a life time. The open railing around the porch deck ensures safety, but still allows people to see beyond the porch deck. The deck in this particular photograph has been made using poured cement. This method is a great idea because it ensures the porch will last a long time, not collect water or snow, and will be easy to sweep clean when or if leaves fall on it, or other debris. The Cape Cod Home is available in sizes 13 feet by 28 feet to 13 feet by 48 feet so there is sure to be a size that suits anyone’s needs. It has a traditional New England look with it’s 12/12 pitch roof and dormers. Each of their certified homes goes through an inspection process while it’s being built so that it will meet all building codes and regulations. Each log home comes with the stained Log Siding, a 5 foot deep porch with round log railing, the entry door which can be painted any color, all of the windows and shutters. It also comes with the roof and shingles as well as the materials to build the dormers and the windows for them as well. So customers have everything they need to build their dream home.